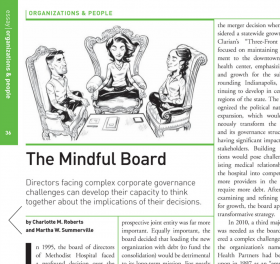 In an article in Strategy + Business, Charlotte Roberts and Martha Summerville review the components to a mindful board of directors. Their wisdom has direct application to how you run your team leader meetings and entire company meetings as an orthodontist. Without first establishing a common purpose, I’m just a mad man telling everyone to do things in an incredibly specific way and asking employees to crawl through broken glass for no reason. However, when new employees see the impact we make in the lives of our patients, our foundation reciptients and in the lives of our coaching clients and their employees all over the world, they immediately “get it” that we must do things very differently than other doctors offices if we wish to get such dramatically-different results in so many areas. Take a moment and review how you bring your team and your team leaders together. Never assume because you talked with them once about your company mission, vision and overall purpose that they still remember it or feel as strongly as you do about it. You must remind them over and over again and sincerely mean it when you talk about why your practice does what it does and why. Without this core mission and common purpose, you’re practice is adrift at sea, affected by any wind that blows. Set your course by starting each meeting with renewing the connection of everyone at the table with your reason for existing as a company. Then, watch your results soar.